I am always looking for new recipes to make for my family. I often pass by the deli counter in my local grocery store to see what’s new in the way of salads. On one trip, I noticed a very interesting looking salad. It was a very colorful mixture of red, white, black, and green. Intrigued, I asked the girl behind the case what it was. 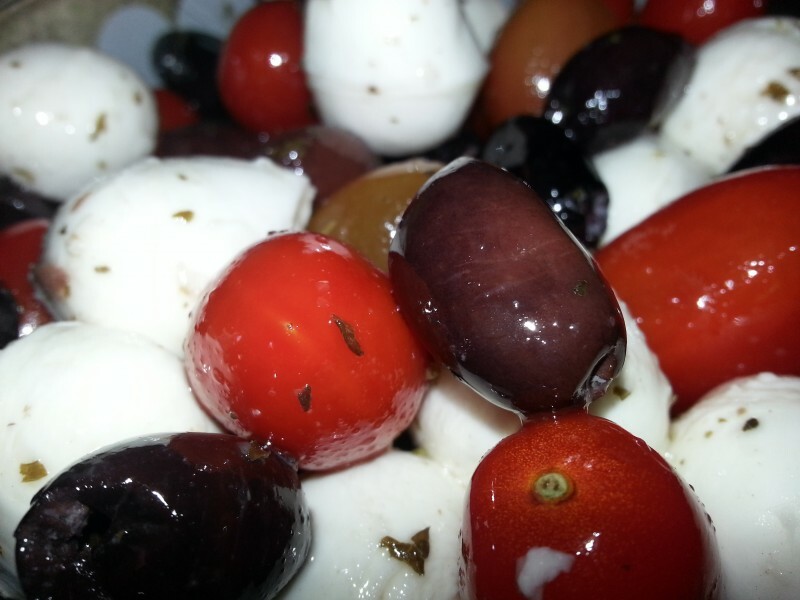 She said it was a mixture of tomatoes, olives, and mozzarella cheese. I was very interested in what the dressing was, but since I didn’t want to part with $5.79 per pound, I thanked her and walked away. As I finished my shopping, I thought about the colorful salad, and wondered what might have been used as a dressing. Finally, I gave in to my impulse to experiment and bought an 8 ounce package of Fresh Mozzarella Cheese Cilliegine. I also picked up some kalamata olives. I already had grape tomatoes at home. I chose to use Pesto in my dressing because I kept thinking of Margherita pizza, and Caprese salad, and thought that the basil in the pesto would go well with the tomatoes and mozzarella. We weren’t disappointed. This salad was excellent. All of the flavors perfectly complemented each other. I especially liked that there was no cutting or chopping required. Everything was just tossed together in a bowl, and voila, the salad was ready. Awesome flavor and ease of preparation. What more could you ask for? Here’s the official and printable recipe. Give it a try and let us know what you think. Thanks for visiting Patty Cakes Pantry. This salad is a simple combination of 5 ingredients and requires no cutting or chopping. It's a perfect salad to throw together for an impromptu get together with friends. 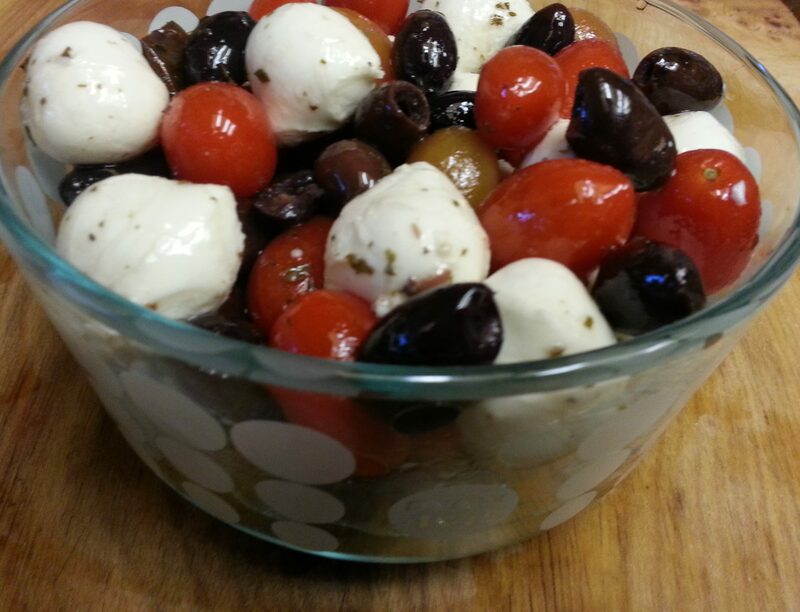 Drain mozzarella and place in a bowl. Wash and dry the grape tomatoes and place in the bowl with the mozzarella balls. If the olives are packed in brine, drain them. If they are packed in olive oil with herbs, skip this step. 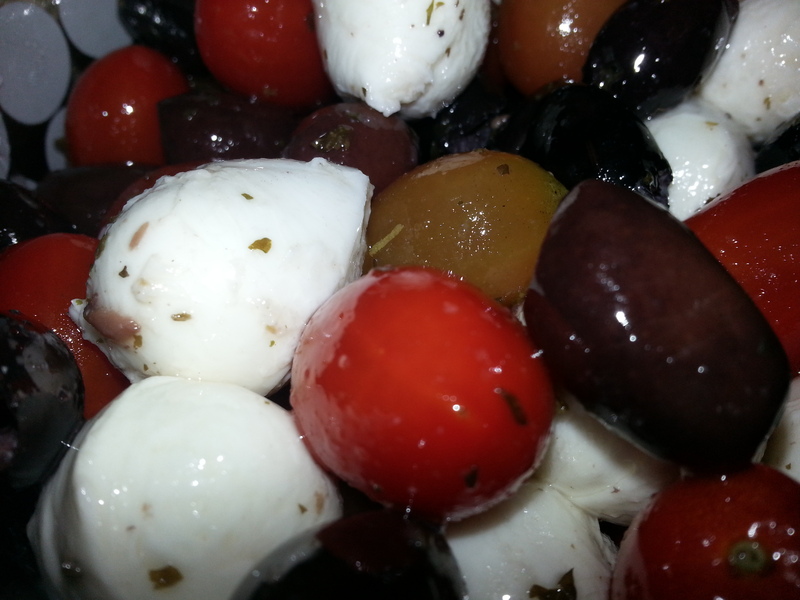 Add the olives to the tomato and mozzarella balls in the bowl. In a cup, mix together the pesto and the olive oil. Allow to sit in the refrigerator for at least an hour for the flavors to mix together. I prefer to allow it to sit overnight for maximum flavor.